There are so many sources of enjoyment in life: Hearing a choir perform Mozart’s Ave verum corpus in a candlelit concert at Notre Dame Cathedral in Paris is one of them. Another is watching two good football teams knock the stuffing out of each other. TEXAS Only a last-second TD by Texas Tech kept the Longhorns from an undefeated season in 2008. QB Colt McCoy, who was second in last year’s Heisman voting, returns. The pass defense should be stronger than the unit of a year ago. Texas is a lock for at least 10 wins — how many can they get beyond that? 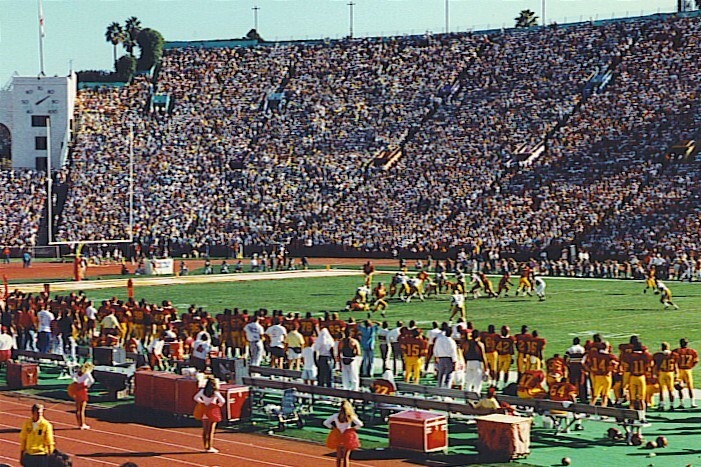 USC The Trojans’ string of seven consecutive seasons with at least 11 wins could be in jeopardy. Last year’s defense was among the best in college football history; only three starters from that unit return. Quarterback is also a concern with the departure of Mark Sanchez. Coach Pete Carroll always seems to find a way to fill holes, though, so the 2009 edition may once again be among the nation’s finest college football teams. FLORIDA Last season’s national champion averaged over 43 points per game; opponents averaged only 12.9 points against the Gators. Most of the lettermen return, including QB Tim Tebow — and all 11 defensive starters. The favorable schedule includes Charleston Southern, Florida International, Troy, and Tennessee. OKLAHOMA The 2008 offense was statistically the best ever. The Sooners scored 99 touchdowns and were the first team in history to have two 1,000-yard rushers and a 4,000-yard passer. Running backs Chris Brown and DeMarco Murray join quarterback Sam Bradford for an encore — but most of last year’s offensive line doesn’t. If that group can be rebuilt, Oklahoma could challenge again. VIRGINIA TECH The Hokies don’t get as much national acclaim as the schools listed above, but here’s something worth considering: over the last five years, which three teams won at least ten games each season? Right, Virginia Tech is one of them (USC and Texas are the others). They should get to that plateau again; how they fare against Alabama in early September will give us a clue if they’re truly championship-caliber. To be polite, I suppose we should include a team from the Big 10. Ohio State and Penn State are probably the best from that conference, but both have lost a lot of talent. The Buckeyes no longer have stars like Beanie Wells and James Laurinaitis; thirteen 2008 starters are gone from the Nittany Lions. I expect both squads to be good, but not among the very best. Meanwhile, fans of the Big East conference won’t have much reason to get excited until basketball season. This entry was posted in Sports and tagged NCAA football. Bookmark the permalink. You were right to omit OSU and The Big 10. Their continual lack of team speed especially on the defensive side of the ball has been exposed for the last several years. I hate to admit it but it looks like a TEXAS v FLORIDA final this year.